A Thanksgiving Service celebrating the life of Cynthia Alice Almyra Rymer de Castro was held at the St. George’s Episcopal (Anglican) Church on Saturday 23 July. 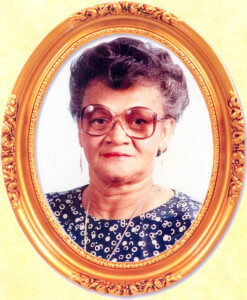 Mrs. Rymer de Castro was born on 7 August 1924 in Road Town, Tortola, and departed this life on 11 July 2016 at her home on Main Street just a few weeks short of her 92nd birthday. Cynthia was the third child and first girl born to Stewart Athelin Rymer and Marie Louise Titley Rymer of Road Town. In her younger days her parents insisted that she attend all church functions including church cleaning on Saturdays and Sunday school. As a lifelong active member of St George’s Episcopal Church Cynthia held many positions in the church — she was a Sunday school teacher, sang in the choir, and in the Episcopal Church Women she served in numerous positions. She attended the Chapel Hill and St George’s Schools. After completing her studies she went to work at H.R. Penn’s Store on Main Street where she worked as a sales clerk until she got married Aubrey de Castro on 14 June 1945. The couple were married for 58 years, a union that ended only with the untimely passing of Mr. de Castro on 24 April 2003. The couple had four children: Miriam Isola, Joseph Edward, Margaret Almyra, and Paul Ricardo. Cynthia and Aubrey opened their home to many persons who needed to be in Road Town for work or school. Back then Tortola had no hotels, no restaurants, no laundromats, and travel back and forth to the various villages was not as easy as it is today. Cynthia and Aubrey’s home in Road Town hosted both family and friends from near and far. She was community spirited and participated numerous times in the August Festival, including one memorable year when Cynthia and her sisters and friends made Japanese kimonos complete with hand sewn embroidery for their festival troop. In the 1980s she opened the well-known Cynthia’s Boutique which carried the best in women’s lingerie, beauty products, and jewelry. Whatever ladies required Cynthia’s Boutique would either already have it or could quickly acquire it from one of her numerous suppliers. Ever the community stalwart, Cynthia was an active member of the Lions Club of Tortola II. She held many positions and received numerous awards from the Club. Although a busy entrepreneur Cynthia still continued to assist in the raising of her grandchildren. Those who lived overseas attended what was affectionately referred to as the “Nanny and Daddy Aubrey Summer Camp” every year. The Thanksgiving Service was presided by Rev. Canon Lionel S. Rymer; the concelebrants were: St. George’s Rector Rev. Dr. Ian Rock, Rev. Canon Julian M. Clarke and Rev. Erminie George. The dear departed Cynthia Alice Almyra Rymer de Castro is survived by her Daughters — Miriam Isola de Castro Narine, and Margaret Almyra de Castro Penn; Sons — Joseph Edward Alberton de Castro, and Paul Ricardo de Castro; Daughters-in-Law — Gretta Delita Donovan de Castro, and Carmen Lourdes de Castro; Sons-in-Law — Romney Averad Penn, Sr; Grandsons — Romney Averad Penn, Jr., Esq., Renard Alberton Penn, Esq., Dr. Jovaun Alberton de Castro, Kai Edward de Castro, Laurence Dimitri de Castro, and Ericson Charles de Castro; Granddaughters-in-law — Dr. Cecilia Akuete Penn, Renee de Gannes Penn, Esq. ; Brother — Rev. Canon Lionel S. Rymer; Sisters — Doris Rymer-George, Margaret Rymer-Borde, Avis Rymer-Hosein; Brothers-in-law — Dante de Castro, and Paul Christian; Sisters-in-law – Janet de Castro, Riisa Rymer, and Claudia Christian; plus many other relatives and friends too numerous to mention. The publishers, management and staff of The Island Sun extend heartfelt condolences to the bereaved.